Gayatri Reksodihardjo-Lilley, founder of LINI. Photo by Surya Risuana. On a sun-drenched morning in the village of Bone Baru, I sit in a traditional Bajo house, listening to the hush of waves below me and the crowing of a rooster in the next room. This house, perched on stilts over the sea, seems an appropriate setting in which to interview Gayatri Reksodihardjo-Lilley, the force behind LINI (the Indonesian Nature Foundation), an organisation that is changing attitudes and lives in coastal communities in Central Sulawesi. Established in January 2008 by a small group of dedicated professionals, LINI is one of the few Indonesian non-profits currently working towards the development of community-based marine conservation areas to promote sustainable fisheries in Indonesia. The organisation works with communities in three regions – northern Bali and the islands of Banggai and Banda – on a range of coastal conservation and management issues including sustainable octopus and tuna fisheries, coral reef restoration and responsible collection and management of ornamental fish populations. The coral reef off Banggai, Central Sulawesi. Blue Ventures / Garth Cripps. Gayatri’s dedication to working with coastal communities is apparent, but this is neither a fast or an easy process. A huge investment in time and energy is needed to encourage a community away from destructive fishing practices and over-exploiting natural resources; developing more responsible fishing practices, supplementary livelihoods (like tourism and aquaculture) and activities to support the recovery of marine environments. All of these will, in the longer term, benefit both people and the ocean, but that is not always immediately evident to communities! One of the most memorable parts of her work, Gayatri said, has been seeing the change in the behaviour and attitudes of fishers in the Bajo village of Popisi, on the island of Banggai, Central Sulawesi. 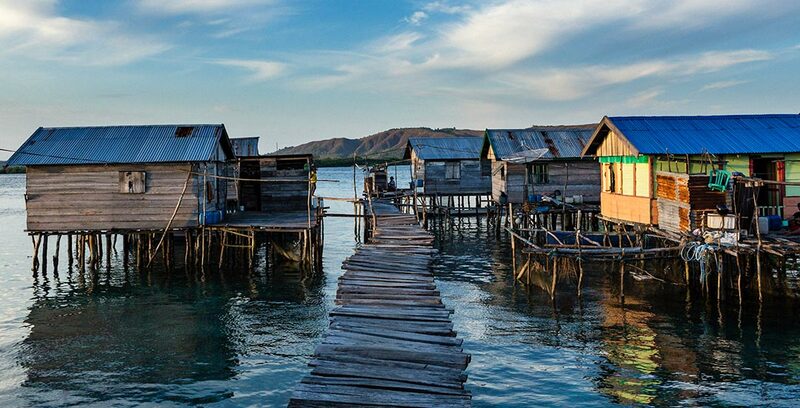 The Bajo people are a seafaring people who are entirely dependent on the ocean for their livelihoods. The community were known to use a number of destructive fishing techniques, including blast fishing (using small quantities of explosives to kill fish) and cyanide poisoning. Some organisations have been hesitant to work with them, believing that it would be challenging to overcome this practice and change the collective behaviour of fishers. But Gayatri believed that with patience and the right approach, the community could be supported to adopt more sustainable fishing practices. She first visited the community in 2016 to develop relationships with the people there, understanding that without this foundation, she could achieve nothing. Outsiders are rare in such communities, but by learning about and respecting local ways of life, Gayatri built the foundations for a strong collaboration between LINI and the community. Gayatri and her team then organised the local octopus fishers as a group, enabling the LINI team to coordinate meetings with all of them at once. They provided training on how to manage their fisheries in the longer-term, including collecting data on catch rates, monitoring the marine environment and developing temporary closures of octopus fisheries (which allow octopus to grow bigger and more valuable). This investment in building a trusting relationship with the Bajo community paid off – two years after LINI started working with them, fishers have a solid understanding of the concept of managing resources and are now leading efforts to responsibly manage their octopus fishery. The leaps and bounds this community has made have proven that, given the right opportunities and skills, they can manage their own resources and activities in a sustainable way. LINI has also facilitated fora in which representatives of the Bajo octopus fishers have shared their knowledge and experiences with broader audiences including local government. This once-marginalised community now has a voice, and has set an example that neighbouring villages are eager to follow! This connection with people, and placing communities at the heart of her work, is a defining feature of Gayatri’s approach to marine conservation. “In Indonesia, over 60% of the population live in coastal areas and make a living from the marine environment. So if you want to work in marine conservation in Indonesia, you have to be willing to work with those communities!”. This message, she says, is one she shares with the all those who take part in LINI’s internship programme. The positive impacts of Gayatri’s work on coastal communities is clear: new livelihoods have been created; fishers have abandoned destructive fishing techniques, and LINI has provided training and guidance to support communities in managing their own fisheries. But the impact Gayatri and her team are having also reaches into the future. Through the LINI internship programme, young people are actively encouraged to become involved in fisheries management. The programme acts as a stepping stone between university and employment, giving young Indonesian graduates an opportunity to gain practical experience, and Gayatri is especially supportive of female applicants. Retno Ningrum spent three months as a LINI intern in 2018, after completed her Marine Science studies at Padjadjaran University. The internship, she said, gave her invaluable experience in marine conservation beyond the classroom, in coastal environments and amongst the communities whose lives are linked to those environments. She gained practical skills that university had not given her: experience in writing for the LINI website, contributing to a guidebook on clownfish aquaculture, constructing artificial reefs and, through interacting with visitors to LINI’s aquaculture centre, developing her communication skills. It seems she also gained confidence and a voice of her own, and speaks passionately about encouraging women in Indonesia to challenge stereotypes and become involved in marine conservation. Gayatri was more than just a mentor to Retno. “I could ask her anything”, Retno said. “She made me feel like family”. Young Indonesian women taking their first steps into the world of marine conservation have to challenge cultural norms and expectations that they will remain close to their family home and marry at a relatively young age. For these women, having someone who not only provides support and kindness but also leads by example, having forged a path of her own, may provide the encouragement they need to go on and become leaders themselves. Gayatri is proud of the impact the internships have on the lives and career paths of young scientists. She is making waves not only directly through her work with communities, but also by training and inspiring the next generation of ocean caretakers. Retno Ningrum, former LINI intern. Credit: Retno K. Ningrum. Until just a few years ago, there were almost no employment opportunities for women in the village of Les, northern Bali – something Gayatri saw the opportunity to change. LINI had worked with fishermen in Les since 2003, and had good standing with the community, so Gayatri encountered little resistance when she proposed opening a centre for marine conservation and aquaculture. The centre opened in 2015 and to date, over 20 women have been through the ‘learn and earn’ programme, receiving training in aquaculture (the centre breeds Banggai cardinalfish and clownfish for the aquarium trade), interpretation for visitors to the centre and hospitality skills, as well as a salary. Gayatri is clear: her vision for the aquaculture centre was as a way to empower Balinese women. She certainly seems to have succeeded; many of these women did not have the opportunity to complete high school, but have proven capable aquarists, and 11 of the trainees are now employed at the centre. And Gayatri knows that the impacts of empowering those women will reach far beyond the individuals themselves. “Women have a really important role in daily society here. I believe that by educating women and valuing them, we can increase their understanding of and engagement with environmental issues. In turn, they will pass that engagement on to their children, and other sectors of society”. Gayatri’s commitment to working with and listening to communities is inspiring. She notes that despite all her years of experience, she is still learning – as we all are. This humility – her willingness to learn from others, including her interns, colleagues at all stages of their career, and of course from the communities themselves, is perhaps what makes her stand apart. Indeed, generosity and humility seem to be the principles underlying all of Gayatri’s work. Through these principles, she is building capacity amongst the next generation of Indonesian researchers and conservationists, inspiring young women to join their ranks and providing new skills and opportunities to empower women in rural communities. This grounded and energetic woman is a role model for women in marine conservation and management, not just in Indonesia but everywhere. Ruth is the Communications Coordinator - Outreach for Blue Ventures, and works alongside partner organisations and communities to communicate the activities and results of collaborative fisheries management and conservation efforts. She has a PhD in marine biology and over fifteen years of research expereince.